This is the biggest update yet to Deck Around! Now's a great time to buy a copy. See? I really do read all your feedback emails! Keep 'em coming. One of the coolest changes is the new card stock, so I'll take a minute to explain it. This is a 305 gsm card stock with a black core used by thousands of popular games including Magic The Gathering. You might not care about that sort of thing unless you're a card game dork though! What's probably a little more exciting are the new words and definitions! The new definition copy and slang words have been suggested by users like you and the entire game has gone under the scrutiny of heavy testing (game designers call this pretentious process, "playtesting"). 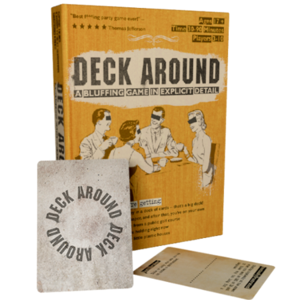 This means the new version of Deck Around is truly the best version of the game yet.